Enjoy an evening with SAJA at Junoon Restaurant in NYC on December 8 at 6p.m. Appetizers and wine included. Meet renowned chef and author Vikas Khanna. 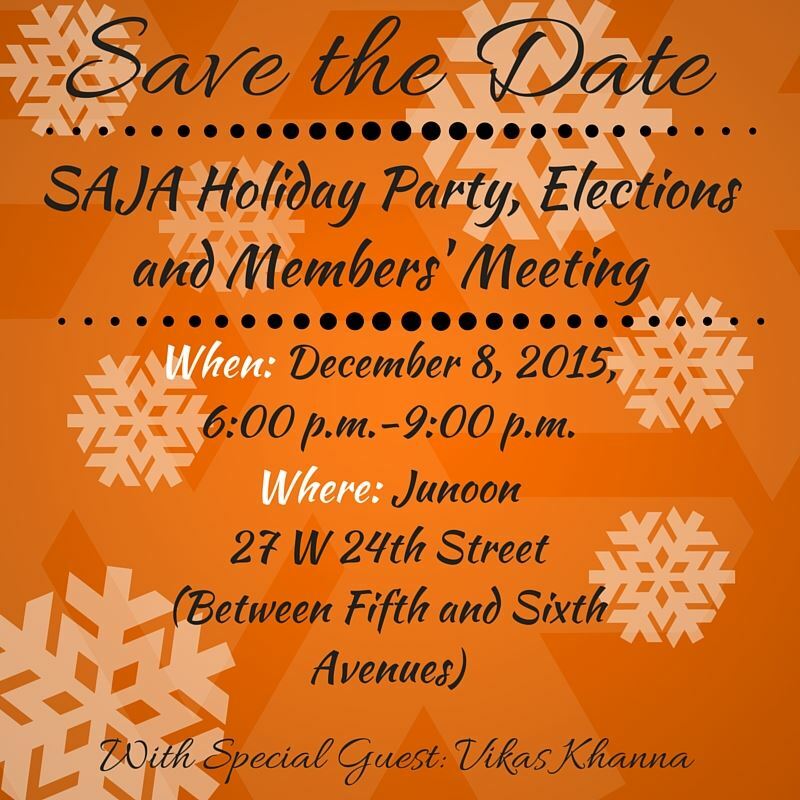 On Tuesday, December 8th at 6:00 p.m., SAJA will hold its annual members meeting and board elections at Junoon restaurant in New York City, where you will get an exclusive opportunity to meet the renowned chef and author Vikas Khanna. You will also have the opportunity to buy an autographed copy of the book! The holiday party includes wine and appetizers. We have four open positions on the board, apply below! Four (4) SAJA board member positions will be open for the two-year term of 2016-2018. To contest, please submit a statement of interest by midnight (12:00 a.m.) on Friday, November 27, 2015. To apply for a SAJA Board position, please email a statement of interest of 250 words or less to mrao@wnyc.org. Voting will be conducted in person at the annual meeting and based on online proxy ballots, which can be cast from November 24, 2015, through 3:00 p.m. (EST) on December 8th, 2015. Only Full Members are eligible to contest for a position the board. Associate Members and Student Members are NOT eligible to contest. All Full Members are encouraged to consider running. Those who have a strong interest in journalism and coverage of South Asia(n) issues are urged to consider running for the election. Important requirements for serving on the board are a spirit of teamwork, leadership and the commitment of at least 3-5 hours each week on activities ranging from organizing events to judging applications for awards and scholarships. Candidate submissions must include their full name, current snail mail address, e-mail address and phone number.